loop outside the pouch that holds a key chain. and quite addictive, so I hope you enjoy this tutorial. 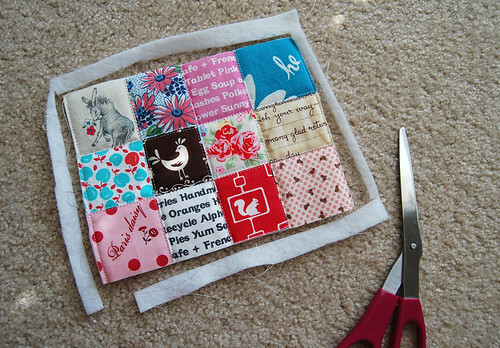 We start off with twenty four 2 1/4" squares. the other twelve go to the back side. After you have four strips, it's time to press. piece matches with corners of other squares around it. 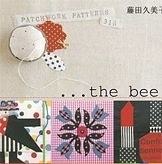 twelve squares, we have two patchwork panels. 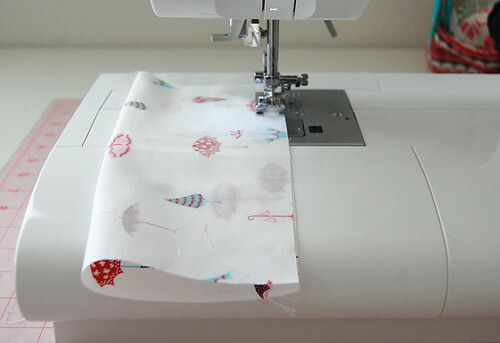 rather than using fusible batting. 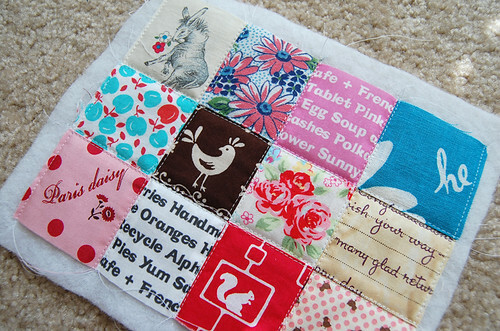 The quilting style here is totally up to you. Then we cut off the excess. Now let's move onto making a handle. recommend that you use interfacing. 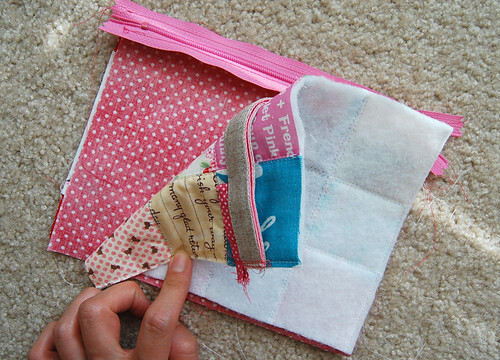 Folding each long edge toward the middle..
Then top-stitching both long edges. press this piece like this and..
top right corner like this. So your pocket looks like this. Not so cute, so let's turn it inside out. 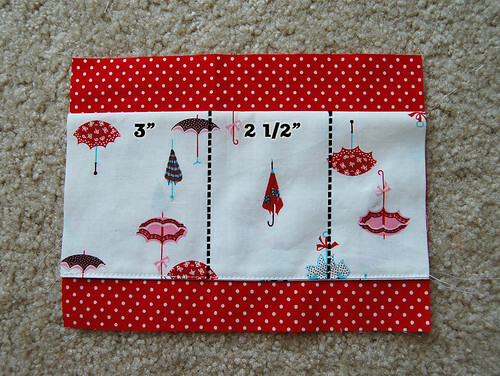 about 1 1/4" above the pocket. so it looks like this now. Using a water soluble pen, draw these lines. for your chap stick, if you like to carry one. you'll deal with less pins later. too) but it is actually not that hard. Trust me. I'm in love with the shop, hehe. 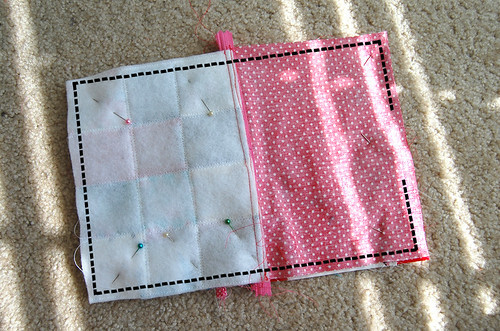 start sewing from the end of the zipper. Here, your zipper is completely closed. 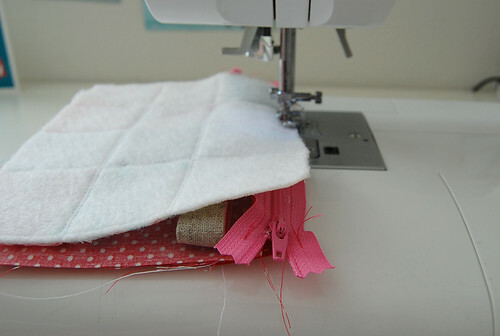 lift down the foot again, and keep sewing. 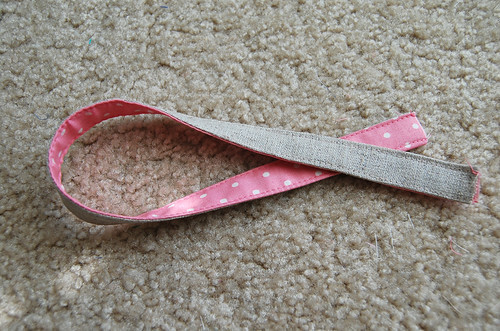 straight if a zipper-head is near the foot. 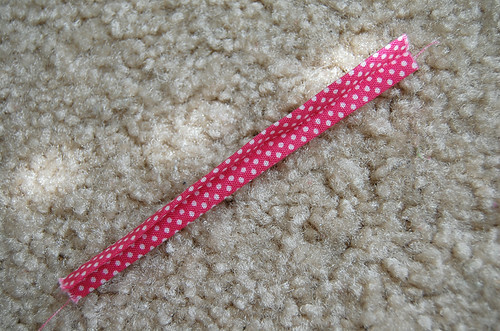 piece I attach to a zipper. 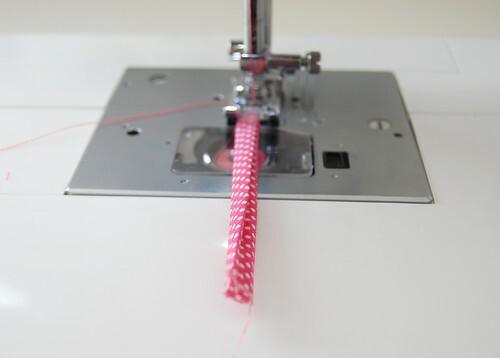 is aligning with the zipper, it's totally fine. this onto the zipper now. 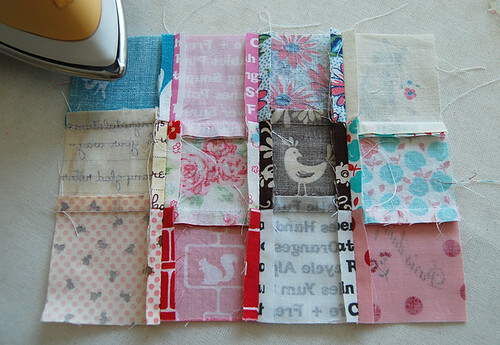 Now we will attach the other patchwork piece. we start off with the zipper completely open. 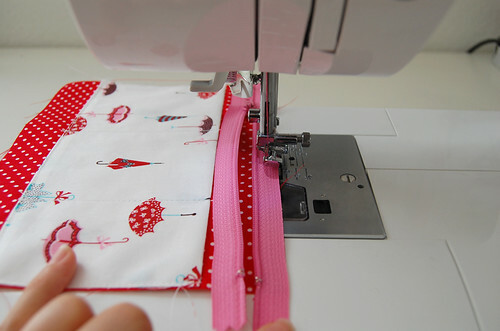 the zipper to keep sewing. 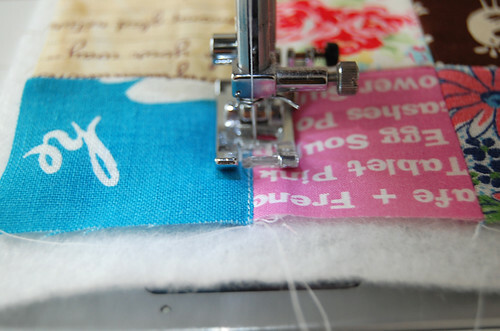 panel underneath the lining piece being sewn. 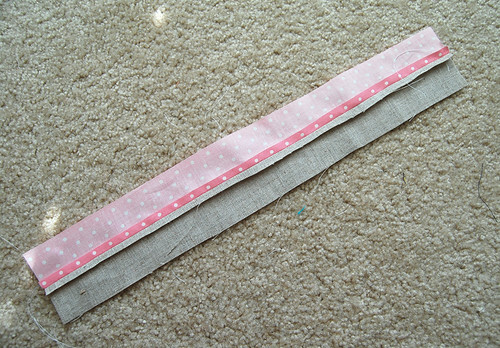 panels together and do the same for the lining.Make sure to fold your handle inside and to have your zipper about 80% open.Sew the dotted line, with at least 2.5" opening at the bottom of the lining. and flip it inside out from the opening. How about adding a key chain here..? friends visiting from Japan this weekend! them with these pouches at the Farmer's market. Yipee! Yay for the tutorial :) Thanks! Love it! Thanks again for another wonderful tutorial. Which is your fabric? Because I'm loving the little blue and red apples - too cute! A great tutorial.. The zip instruction is very good. Thank you! I will sure do one. Thank you so much for another wonderful tutorial - I was looking forward to this one! Wow! What a great tutorial! 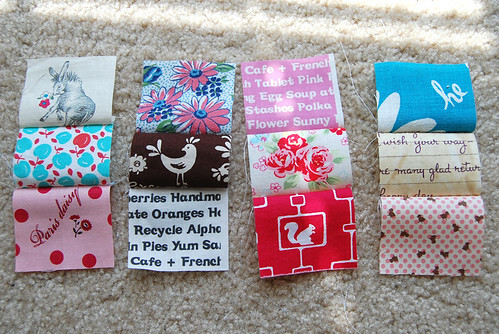 And so much work to make a cute little wristlet! I don't think I appreciated the work as much until I read this tutorial. You rock! This is a wonderful tutorial. It is now on my "to do" list. Thank you so much for the wonderful tutorial.......will go to try it. Thank you for he tutorial! 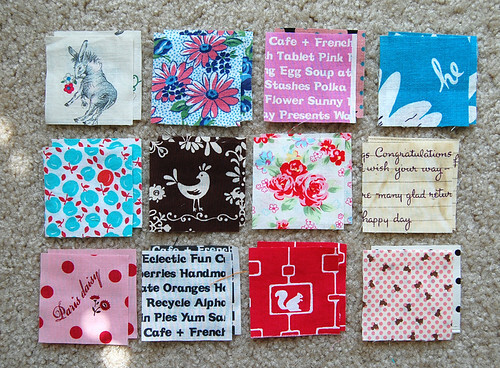 I am in a making pouches mood too lately! I love yours! This is super tutorial!! Thank you so much! Thanks, the tutorial is great! Your tutorials are great and so thorough. They are really helpful to a beginner such as myself. Thanks for putting the time and effort into these. I think I might even give one a try. Thank you so much. I love this little tutorial. 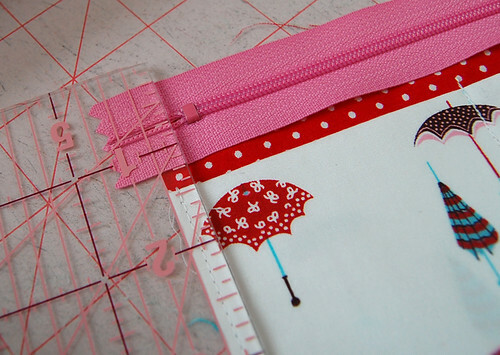 I've been loving making little zipper bags and I'll give this one a try too! thanks so much for the tutorial! This is another stroke of brilliance on your part! you explain things so clearly. 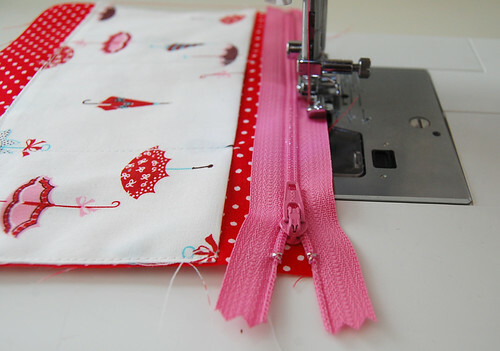 I have recently overcome my zip phobia - I did a course called "the zippers clinic" at a place called The Make Lounge in London (UK) - I've been ordering loads and loads of zips on eBay ever since! It's a holiday weekend in the UK this week - so I'll be having a crack at this one! Well done! (oh and been meaning to congratualte you on your gorgeous new husband!!. I love the zipper application. I am going to try making a bag from my stash of felted wool. Thanks for your hard work. this is so precious! 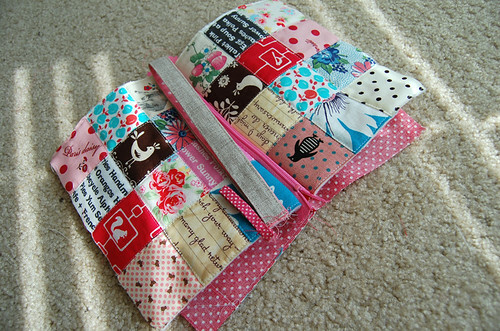 love the patchwork and the pockets are so functional. The wrist straps are just the icing on the cake! Thank you for the tute, can't wait to try one! Where did you get the cute little wooden tile? What a great idea, especially for gifts! Love the detailed tutorial!! 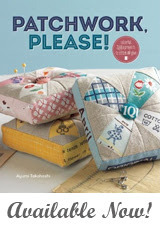 :) I saw this and now have to make this! :) Thank u! Thank you for this tutorial! It was really clear and easy to follow. I made one :) Yay! I love this - thanks so much! Love your tutorials, so clear and understandable with great photos. thank you so much for this tutorial! i've already made the basket and i'm so happy with it. so happy for your explanations! i do have 1 question though.. i simply do not understand how you make the handles. 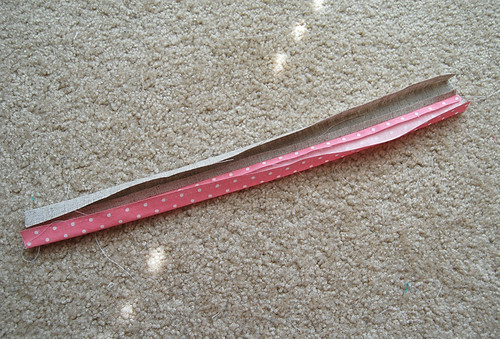 i get this part:Folding each long edge toward the middle..
Best tutorial EVER. How clear and concise. Thank you so much for sharing!!! wonderful! Thank you so much for this tutorial! Your amazing! That's what I was looking for quite some time. Thank you :) (and besides, love the fabrics). 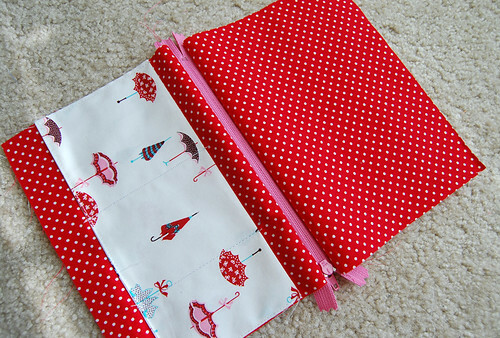 Thank you so much Ayumi, I have now made a pouch and your tutorial is really great! Did you know that a Nintendo fits perfectly in it! Perfect gift for my girls! After making the bento bag yesterday I wanted to make something else straight away. So I made this pouch! I will be posting a picture on my blog soon so I will link to your blog. Its another great tutorial! Thank you very much for this very detailed tuto! Great tutorial! You are so generous sharing with us!! 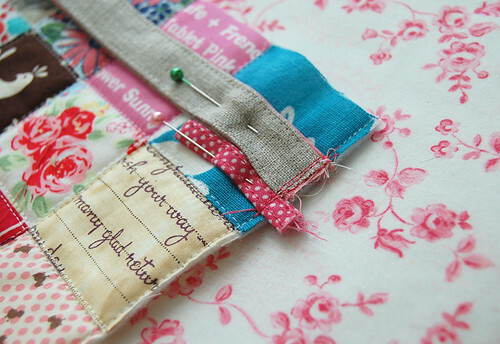 Love your sense of colors and the way you are combining pretty fabric!!! Oh, it's so amaizing!!! I love it so much!!! Awesome. 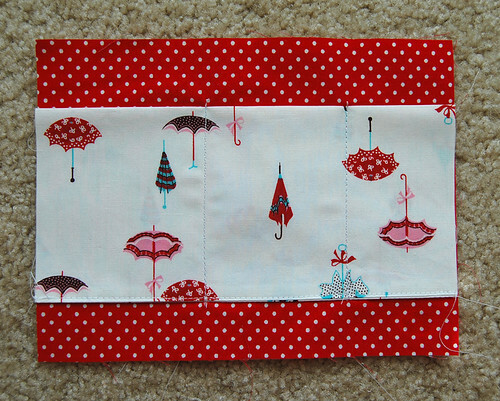 I just posted a pouch that I want to redo because I love the design. I like to see if there are little tricks I don't know about for construction perfection. 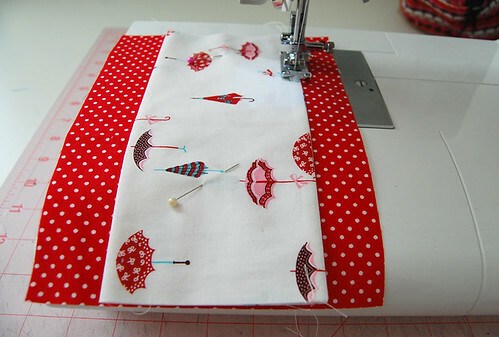 Love that umbrella fabric! I love how informative your tutorials are, Ayumi! Thanks for all the pictures! Sto entrando per la prima volta nel tuo blog: i tuoi tutorial sono chiarissimi anche per chi non comprende la tua lingua. Molte grazie. Thanks a lot for your tutorial! I was looking desperately for something like that! i haven't had a chance to read blogs for a few weeks--i come to yours and there's not only one but two very cute, really well-written and well-photographed tutorials--thank you so much! What a great great tutorial!! Thanks so much for sharing!! love it !!! great tutorial !!! thanks !!! The wristlet is so pretty and the tutorial easily explained. I love your blog!!! What an awesome project tutorial! amazing tutorial, thanks for share it! I can't wait to use it! Love your blog and love your Flickr photos. Thank you for sharing. 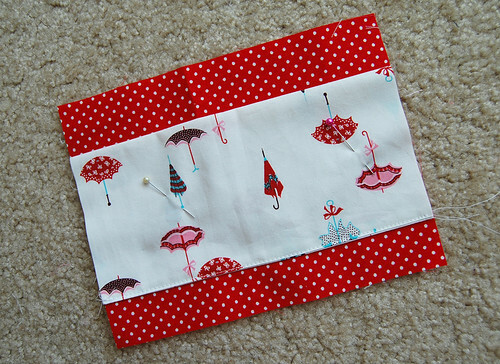 Thank you very much for sharing this tutorial - I am dabbling in some sewing projects and I loved this one right away! 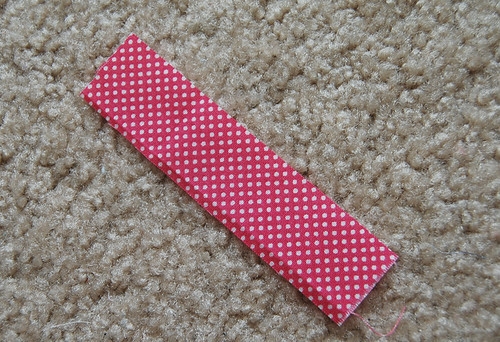 I blogged about my version of the wristlet and I linked here. 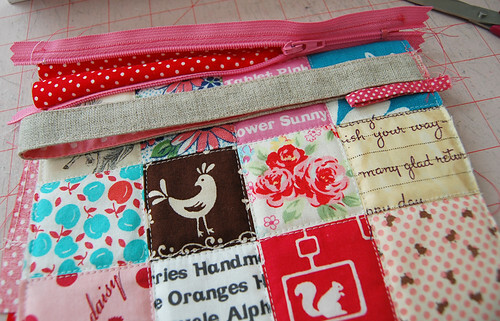 Looking forward to working with the lunch box / bag tutorial next!! What a clear tutorial. Can't wait to try this out. 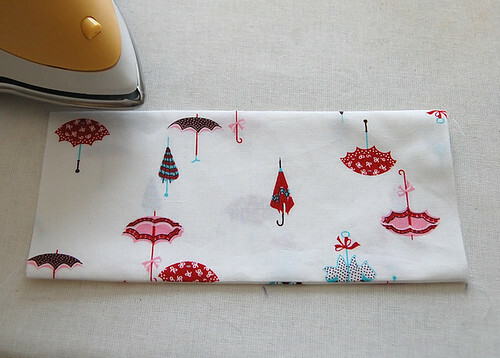 And where on earth do you keep finding these fantastic fabrics! danke für die ausführliche Anleitung ! Thank you so much for your detailed directions! It came out terrific. My only concern, do you happen to h ave any helpful hints for the lining? My lining ended up a little more poofy than I'd like although I did top stitch to the zipper... Thank you for sharing your talent! Thanks for posting. I made this and posted it on my blog with a link back to you. ... absolutely great, and many thanks!!! It's really cute!!! very well explained, I tink I'll do some as Christmas gifts. Thank you very much for this wonderful tutorial. hai ayumi, what the name of the white fabric, inside the pouch, is it silicon press? were do you buy it? medium to heavy weight batting--- what is it? rather than using fusible batting--- what quilitng spray and fusible batting, I'm really new in pacthwork, sorry bothering you much ayumi. 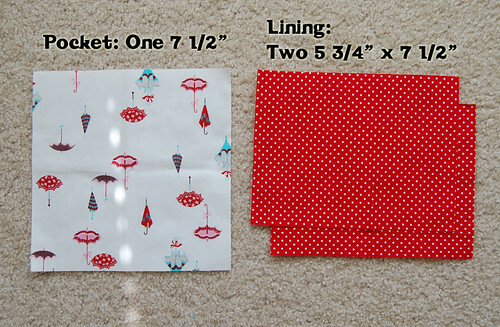 I buy batting from Joann's retail stores, but you can buy the same batting online too here. I can't believe this! I just made something similar last weekend and only stumbled upon this today! Awesomeness! Konichiwa Ayumi. I am pleased to have found your blog. Hi and thank you so much for this great tutorial!! 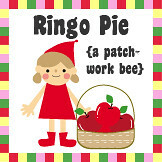 Last thing: please, come back soon on Etsy, I would like to see your shop!!! adorei o blog, são lindos seus trabalhos! I love this! 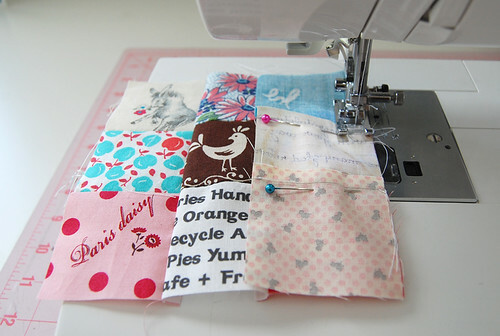 you have the cutest fabrics! One of my dearest friends made me one of these for my "dreaded 40th" birthday! It's adorably cute! She generously shared your blog with me, so that I can try my hand at it. This was wonderful. This is the first time i've attempted a zipper and your instructions and advice were so helpful. Great! This is my weekend project. Everything is so clear. wow...niceee...will try this one too. Can't wait to see if i can make it like yours. thanks for sharing dear. omg these r so fabulous, i just made 2, thinking on 1 for each of my girls .... now i dont want to give them to them I want them for my self !!!! thank you so much for your tutorial , i love it!!!!!! Ayumi, thank you for the great tutorial. 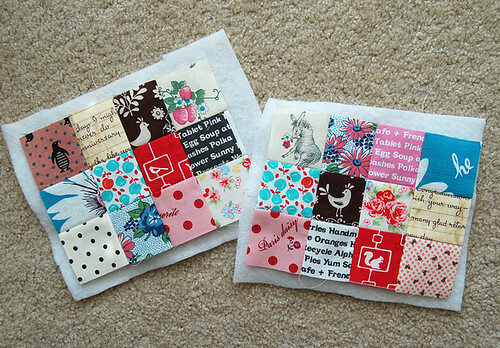 I've done one and put it on my blog with a link to your tutorial. 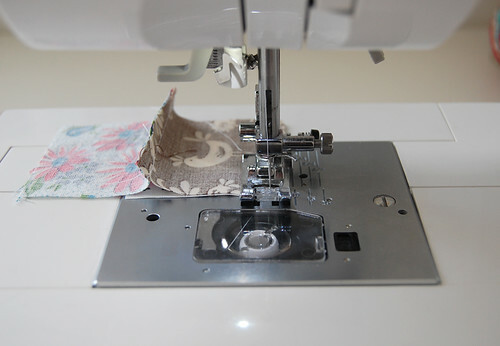 Please kindly visit my blog :Stitch n Sing. I have done another oriental patchwork wristlet. Please kindly have a look . :) Thanks again for your tutorial. I just love to do it so much! 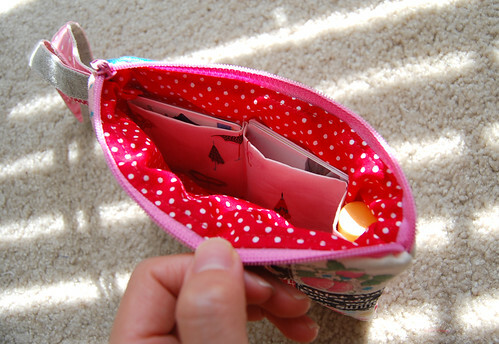 I just finished sewing a wristlet based on your tutorial..Arigatao Ayumi..thank you and terima kasih. Thank you very much to give us all this gifts. This wristlet is so beautiful. 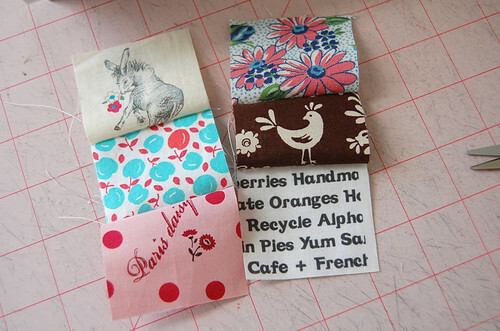 Are you allowing people to make products from this tutorial on a small scale for a boutique? Nice job. I love this. Thanks for sharing the beautiful job. OMG I love it and you explained it so well plus love the pictures it looks FAB thanks!!! your tutorial is so detail, and i very love it. i made one for my daughter, and she'll be thrilled!! 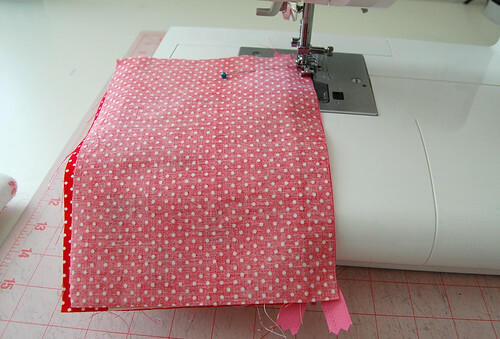 A tutorial to sew a bag like this one is perfect because I spend a lot of money buying bags in the store and this is the perfect opportunity to change my mentality, thanks so much for this tutorial it has been something really simple for me. This is adorable!! I'm hoping to make a couple as Christmas presents this year. I've added it to my 'To Do' list and pinned it. Thanks for the fabulous tutorial. Cute little animals on the patches. 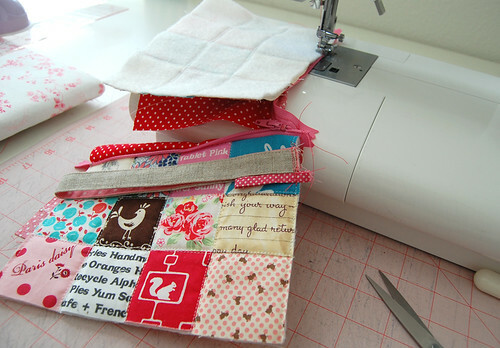 Wow what a great tutorial and purse, i shall have ago at making one of these after christmas....best wishes. Its made....photos to come soon....and regardless to what the person has put above its a great tutorial and ive made two....Thank you so much. This is adorable!!! I love your pictures and simple to follow instructions!!! Love Your blog too!! great tutorials, thanx for an inspiration! 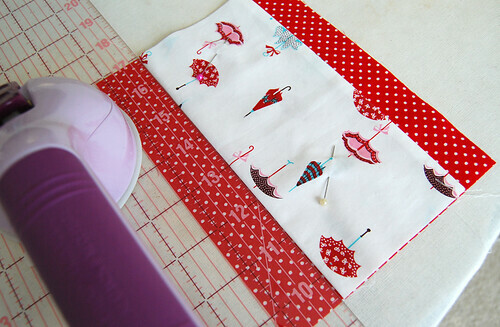 Thank you for sharing your tuto, i love your blog! i just stumbled upon your blog and i was inspired to make on of these last night i have been sewing for years for profit and decided to take a year off and sew just for fun. This was so much fun thank you for sharing. Hey Ayumi! 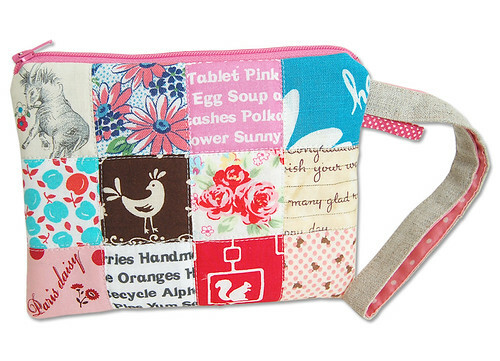 I love this pouch! I made one, too. And I shared it on my blog (it's a very new blog, i started it at the weekend). If you want to see how it looks like: ein-sternchen@blogspot.com. 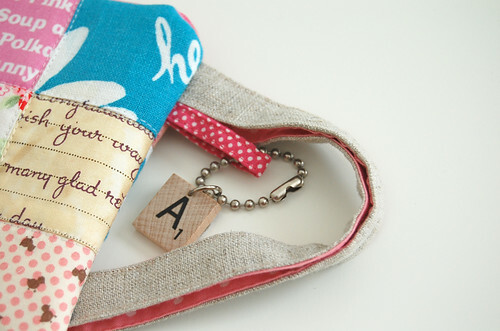 The site is in german, but I told that you have a great tutorial for the pouch. Огромное спасибо за мастер-класс !!!! I love your pictures and simple to follow instructions!!! Love Your blog, Send gifts to Pakistan from UK. Had to make one of these right away! Love your tutorials, they are so easy to follow. Anyway, posted my final produkt on Flickr. This is great! 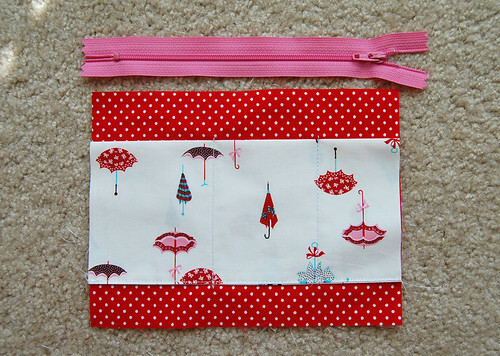 It's a really nice improvement on a zipper bag, of which I've made a few copies already. Now I'll move on to this improved version and make a few more! Thank you for the excellent, clear instructions! Those are so cool! Thank you so much for this tutorial! Love this! Will try it out! Thank you are sharing! I've been following your blog, by email, ok? Great tutorial. Thanks for sharing it. Thanks for this! 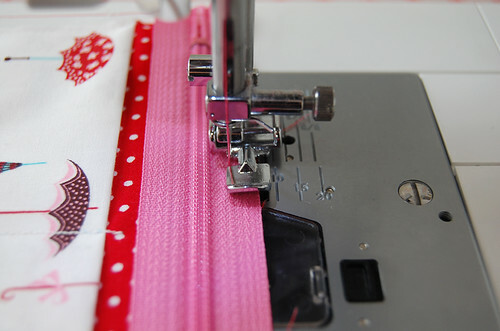 I have never sewed a zipper in my life, and your steps made it so easy! I've made two in the last two days. Check them out if you're interested! Obrigada por compartilhar com a gente!!!! Muiiiiiito bom. 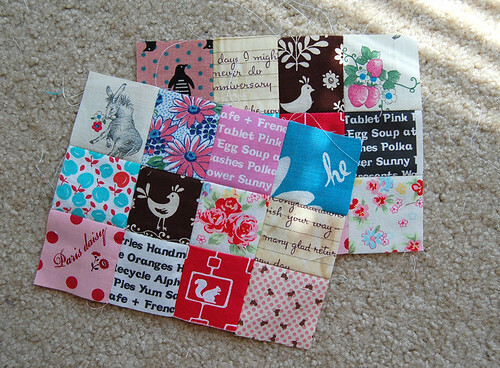 Graças a você fiz a minha primeira costura e meu primeiro patchwork. Estou muiiiito feliz. Sou brasileira. I love the pouch. I love your blog! ok, just made one of these! 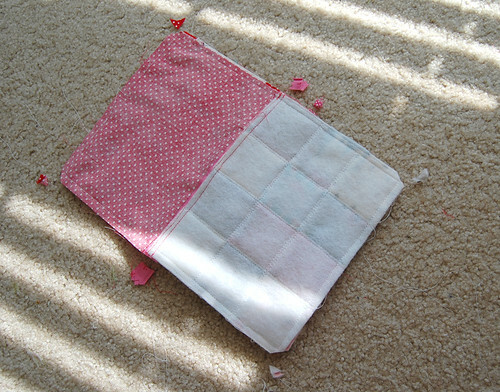 I didn't do the patchwork...I used a bandana fabric. 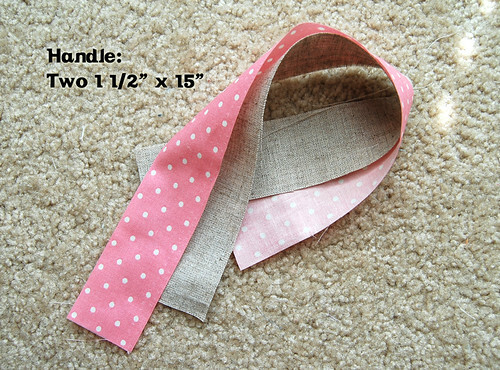 and I used a ribbon for a handle instead of the fabric handle. I am just lazy that way. the only part I messed up on was when we stitched all the way around all of the pieces before we turn it right-side out. I think I sewed over the zipper too much and it looks funny. it still works though and I am VERY happy with it. I needed one with the little pockets inside. your instructions for putting the zipper in were great! they intimidate me very much. thank you again for your awesome tutorial. I will be taking my wristlet everywhere I go!! 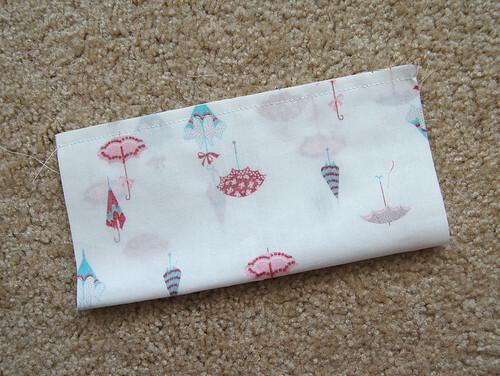 Hi Cheryl, I am so glad you were able to make this pouch successfully in the end and that you are happy with the result :) Thank you for your kind words! Enjoy your pouch! 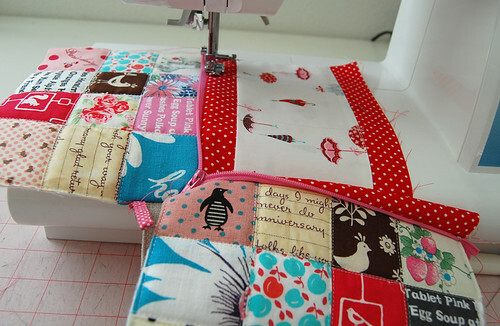 Making the pouch as I type....Really enjoying it. I have never sewed a zipper before so this was a good test. I use a pouch in work for my phone, some coffee money and lipstick. I added a small outside pocket for my ID badge too so it will be just perfect. Thank you so much for sharing and making so many of us smile! I have made my second wrist let and for me this time & very happy with the results So glad this tutorial is always available. Thank you for sharing and for the easy directions. The next project is the bag for my sister. Yeah!!. lovely! thank you so much for the tut! Hi Ayumi, what kind of batting do you use? 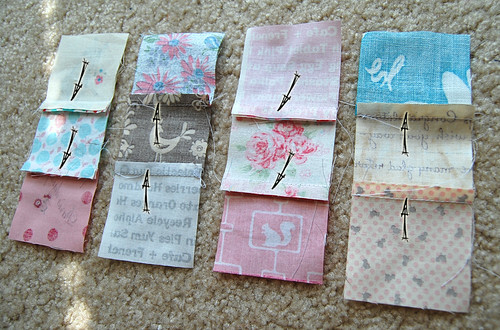 I want to make this so badly. please let me know, the name, or let me know to shop online, thank you so much, is it ok use cotton batting? This is just what I need for my Great niece, she is at the stage of wanting a bag like Granny this is very cute. Might also make one for my holidays much nicer than carrying a big bag everywhere. Thank you, I have recently been searching for information about this topic for a while and yours is the best I've found out so far. After you charge the Secret Key Sequence Invisible Camera for three hours, you are ready to start documenting. The system has a integrated vibrations method that will tell you when you when the unit is switched on, and when it begins taking movie, and still pictures. It won't tell you when you stop shooting movie, so you have to believe that it works. Thank you for perhaps the most level headed thing I have read today. I am sure there are many people who are faced with the same problems I recently had. I couldn't find Just look at the service http://goo.gl/PCirPs. Its pretty easy to use. I think you can get a free trial if you ask for it. This is the very first time I frequented your web page and thus far? I amazed with the analysis you made to make this actual put up amazing. Excellent process!